Fill a rocks glass with ice, add ¼ oz Sirène Absinthe Verte. Let it chill. Stir these ingredients well with ice. Then swirl the rocks glass with ice/absinthe combo and dump (or keep absinthe for enjoyment later). 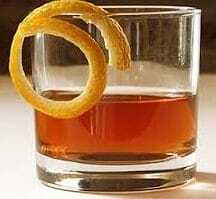 Strain the cocktail into your prepared rocks glass, and garnish with an orange swath or twist.